Mary Sue Milliken is a renowned chef, cookbook author, and television personality. A pioneer of world cuisine since the creation of City Café and CITY Restaurant in Los Angeles in the 1980s, today Mary Sue is most notably recognized as a preeminent ambassador of modern Mexican cuisine with her Border Grill Restaurants (Las Vegas, Los Angeles, LAX Airport, The Huntington Library) and Trucks along with her business partner of 35 years, Chef Susan Feniger. After becoming the first female chef at Chicago's Le Perroquet in 1978, Mary Sue went on to refine her skills in Paris at Restaurant D’Olympe, a woman owned Michelin two-star restaurant. Winning the James Beard Award in 1985 was the first of many honors including lifetime achievement awards from Women Chefs and Restaurateurs, CA Restaurant Association, and Menu Masters Hall of Fame. In 1993, she joined a handful of progressive colleagues to found two important organizations: Women Chefs & Restaurateurs, an organization promoting women’s education and advancement in the restaurant industry and Chefs Collaborative whose mission is to inspire, educate, and celebrate chefs and food professionals building a better food system. In 2018, Mary Sue and Susan became the first women to receive the Julia Child Award for their contribution to the way America eats and drinks. Mary Sue has co-authored five cookbooks, co-starred in nearly 400 episodes of the Food Network’s “Too Hot Tamales,” and co-hosted a food centered radio show for over a decade in Los Angeles. She competed on season three of Bravo's “Top Chef Masters," making it to the finale and winning $40,000 for her charity, Share Our Strength, and its mission to end childhood hunger in America. Mary Sue has served as a fundraiser, board member and advocate of Share Our Strength since 1987 and also serves on the Board of Trustees for the James Beard Foundation. Mary Sue is proud to have been selected to serve the U. S. State Department as a member of the American Chef Corps, working in Pakistan, Malta and Italy to promote diplomacy through food. She is passionate about food policy, working alongside the LA Food Policy Council, Pew Charitable Trusts, Oxfam, Monterey Bay Aquarium and others to help shape sustainable food systems. Mary Sue spends the majority of her time thinking about food and cooks 7 days a week, whether at one of her Border Grill restaurants, Border Grill Truck or at home with her two sons and husband, architect Josh Schweitzer. Josh will join Mary Sue in Italy. 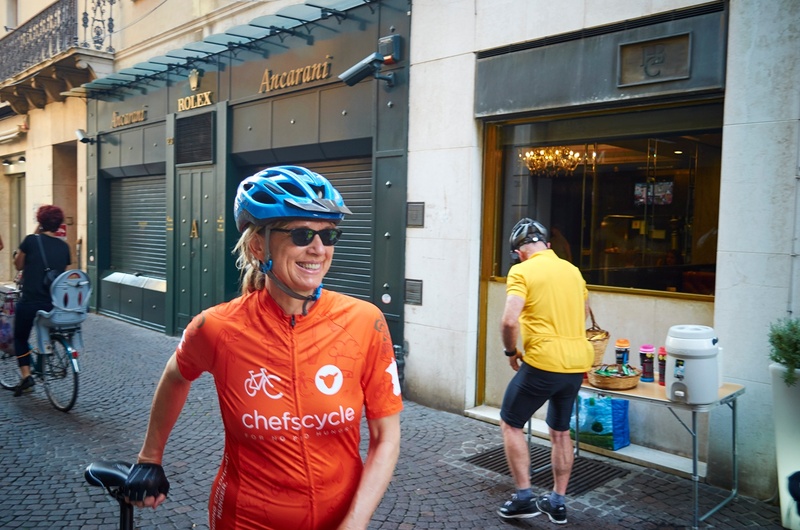 The duo has set to be the perfect host on the Chef Bike Tour Piedmont.